Understanding the Bible and its stories is a key component in developing a strong, lasting faith. To help churches teach these ancient, yet still relevant, stories in interactive, engaging ways, Warner Press is pleased to announce that it will release two new curriculum series, one for children and one for adults, for fall 2016. 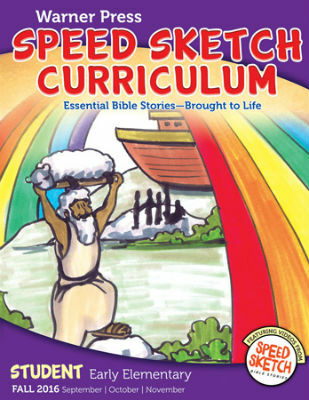 For children, Warner Press will offer Speed Sketch Bible Curriculum. Developed in partnership with Wesleyan Publishing House, this new curriculum helps kids learn essential Bible stories and connect with Jesus, laying a foundation for lifelong faith. Kids are invited to experience Jesus, to follow him faithfully all their lives, and to share the good news of the gospel with others. The curriculum features new videos of accelerated illustrations that bring to life key stories from both the Old and New Testaments. Speed Sketch is the only curriculum on the market that incorporates these exclusive, interactive videos. This fall Warner Press also will release the new LifeMosaic™ curriculum for adults. LifeMosaic focuses on studying the stories of the Bible, finding connections between them, and exploring where we fit in the story. LifeMosaic uses the Narrative Lectionary as a framework to cover the biblical story every year, focusing on a major theme of the Bible each quarter. Interactive lessons go beyond classroom lectures to provide a fresh approach to studying the Scriptures. All of the material for thirteen weeks of lessons is part of one book used by both leaders and participants. Speed Sketch and LifeMosaic will be available to order in July. For more information, contact a Warner Press customer service representative at 800-741-7721. Watch a sample of Speed Sketch on YouTube. Warner Press is a not-for-profit organization of the Church of God that publishes and distributes Christian products, including ministry resources, church supplies, kids’ books, and greeting cards that equip churches for ministry and encourage individual spiritual growth. For more than 130 years, Warner Press has been sharing the gospel of Jesus Christ and serving the Christian community worldwide. For more information, visit www.warnerpress.org. This entry was posted in All Church of God and tagged Bible study, curriculum, discipleship, LifeMosaic, small groups, Speed Sketch, Sunday school, teachers, teaching, Warner Press. Bookmark the permalink.